Portland, Oregon, may not be the first spring break destination that comes to mind with the likes of Miami, Gulf Shores, or Cancún. 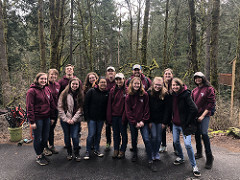 But if you ask any of the 12 Elks scholars and alumni who spent their spring break learning, serving and connecting in the Pacific Northwest, they will always remember the spring break they spent in Portland in 2019. Although they came from all over the country and most were in Portland for the first time without anyone they knew, the scholars instantly formed bonds that connected them during the week and will last for years to come. Whether it was jamming out in the van, washing windows and shoveling mulch, or playing games late into the night, everyone made connections and memories to take back to their schools and jobs. The variety of service the scholars engaged in helped form those bonds by teaching them about different issues the Portland community faces and providing a sense of accomplishment after a hard day’s work. 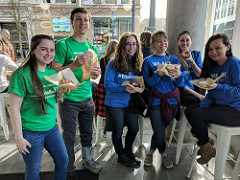 Since poverty, hunger, and homelessness are major problems in the area, the scholars helped with various tasks at non-profits across the city. At Community of Hope, they cleaned and painted the building that houses single-parent families experiencing homelessness to make it feel like a true home. At the Oregon Food Bank and Sunshine Division, the group sorted food, clothing, and other items so people in need can access these necessities. At each service site, the scholars learned about the unique approach each organization takes to work toward solutions. Their service experiences were supplemented with programming and reflection each night to dive deeper into the importance of the work. Portland is known as one of the “greenest” cities in the country, but that title doesn’t come without hard work and dedication from organizations like those the scholars served with. Through Growing Gardens, the group landscaped a garden at a middle school that will be used to educate hundreds of students on the biology of plants and importance of growing sustainable food. At Columbia Springs, they removed invasive Himalayan Blueberries and prepared a space for native species to replace them. At the ReBuilding Center, they hammered, twisted and pulled thousands of nails and staples out of wood so it can be repurposed, reused and recycled within the community. With these projects especially, it was easy to take a step back at the end of the day and see how just a few hours of work made a huge difference in helping organizations continue their mission of caring for the world they live in. After a long week of hard work, there was no better way to end the trip than a night at an Elks Lodge. 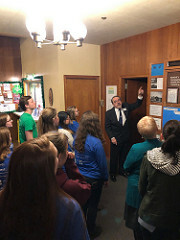 The group traveled to Milwaukie-Portland, Ore., Lodge No. 142, for a night of food, fellowship and fun. After sharing a meal with Elks from Lodges across the state, the scholars toured the massive building—it’s more than 60,000 square feet—learned about its history and saw some of its many impressive features, which include a basketball court and bowling alley. To end the night, Elks and scholars came together to dance to the live band, bringing smiles to the faces of everyone in the room! Although the end of the week marked the end of their time in Portland, it is only the beginning of the scholars’ time as members of the Elks family. In 2014, Safa Khawaja attended the first MVS Leadership Weekend in Chicago as a graduating high school senior. Five years later, she was able to give back with her Elks family once again, this time in Portland, as a college graduate. Without that trust and connection, the work of all members of the Elks family would not be possible. Click here to view photos from the trip. The Elks National Foundation offers three Elks Scholar Service Trips per year. These trips provide scholars the opportunity to learn about societal issues, serve those in need in the name of the Elks, and connect with their Elks family from across the country. For more information about the trips, visit enf.elks.org/ScholarServiceTrips.